The way golf is meant to be played! 7am-dusk, 7 days a week. The bridge spanning the Kishwaukee River has finally been completed and is open. The Sycamore Park District would like to that ERA Engineering and Martin Construction for the hard work in completing this project. We especially wish to thank all our customers for their patience in this long, seemingly never-ending process. Please come out and enjoy all 18 holes as they were designed to be played! The rapid melt of snow cover and flooding rain in late February caused the main bridge on hole 18 to become inaccessible from either side. Both approaches must be repaired according to professionally engineered specifications. To ensure golfers have a full 18-hole round, a temporary 18 tee box has been placed on the west side of the Kishwaukee River making the normally par 4 hole, a par 3. The Sycamore Park District had engineers on site shortly after the damages occurred. Plans and engineered drawings have been submitted for approval to the Illinois Department of National Resources and the Army Corps of Engineers – a process that can take 3 to 6 weeks. Once approval from these parties has been received, the repair process will begin. With favorable weather and river conditions, this should take another 3 to 6 weeks. The adjustment to tee placement makes the 18th hole 134 yards from the white tees and 126 yards from the red tees. Access to the 18th green is along the west side of the river to the bridge located on hole 10. Once repairs have been completed the 18th hole will return to its original tee and length. We hope regular golfers find the new tee location to be an interesting change of pace. Thanks for your patience as we work to get this fixed as quickly as possible. 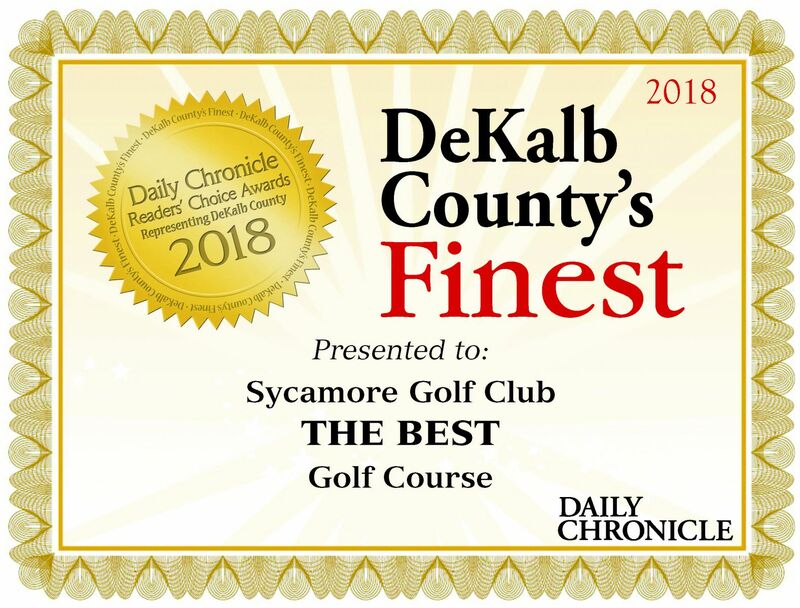 Welcome to Sycamore Park District Golf Club, your number one option for a round of golf in Sycamore, IL and one of the best courses in all of DeKalb County. Our course offers a great blend of challenging golf and relaxing scenery. We offer great deals on season passes, we have many options for golf instruction, and we have the region's best venue for hosting your tournaments and other special events. The Sycamore Park District is an equal opportunity employer and provider. Sycamore Park District Golf Club, located in Sycamore, Illinois, was built in 1923. The course features tree lined bentgrass fairways and large bentgrass greens. Built along the Kishwaukee River the course plays just under 6,000 yards and offers a fair test of golf for the experienced player and gives the novice player an opportunity to score well. 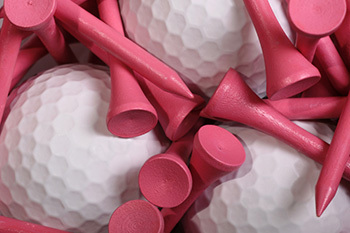 The pro shop offers a wide variety of golf merchandise featuring the top brands in the industry. 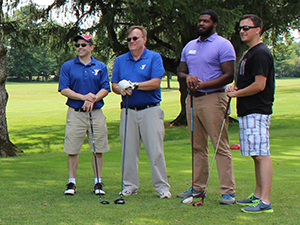 Sycamore Golf Club prides itself on its course conditions, reasonable prices and its service oriented staff featuring a PGA Professional. The Caddyshack Grill, located in the Clubhouse, offers daily food service for that quick bite during your round and full service catering for events. Sycamore Golf Club is located just east of beautiful downtown Sycamore on Illinois Rt. 64. The Sycamore Golf Course offers the best in equipment and apparel to compliment your game. Stop by our fully-stocked Pro Shop before or after your round and browse through name brands. Search available tee times with convenient and secure online booking. 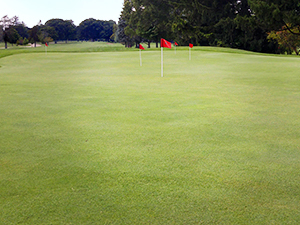 All rates at Sycamore Community Golf Course are subject to change without notice. Congratulations to the following people who have made a hole-in-one at Sycamore Park District Golf Club in 2017! This league is named after the late Sam Mobile and is offered to male season pass holders who have a handicap of 10 or less. Play is based upon the traditional match play format and is made up of individuals not teams. The field will consist of up to 20 players. Two points will be given to a player for winning a match. One point will be given to players whose match ends in a tie. The league fee is $35 per player and all monies go into the year-end prize pool. This afternoon 9-hole men's league is the most popular of all leagues at Sycamore Park District Golf Club. A total of 64 players, or 32 teams, are accepted. Play is in two-person teams. Handicaps are used to create team scores. Low team total, low handicap against low handicap and high handicap against high handicap. A Closest to the Pin and a Longest Putt games is offered each week. The field is broken into two divisions, the Irons and the Woods. All USGA rules are strictly enforced. This 9-hole league was offered on Friday afternoons for two seasons and has become very popular. It was moved to Sunday afternoon in 2002 in order to accommodate more couples. Play is always in foursomes. A variety of formats and games are played during the season. Dinner is offered in the clubhouse every league night at a cost of $10 per couple. The league fee is $20 per couple and all monies go into the weekly prize pool. Play begins Sunday, June 10th and runs through Sunday, August 19th. Kirk has been a member of the Professional Golfers' Association of America since 1988 and has been an instructor of golf since 1982. He is highly sought after in Illinois as an instructor and clinician. Kirk has been featured as a clinician at the Illinois PGA/Chicago Tribune Golf Clinics, had articles published in Chicagoland Golf Magazine and has appeared on Golf Extra on Chicagoland Television (CLTV). As a player, Kirk has recorded several course records in both Illinois and Florida including a ten-under par 62 at Fiddlesticks Golf Club in Ft. Myers, Florida. For lesson package information or to schedule an appointment, contact Kirk at 815-895-3884 or kirkl@sycamoreparkdistrict.com. The Pro Shop offers the best in equipment and apparel to compliment your game. 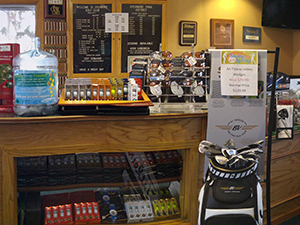 Stop by our fully-stocked Pro Shop before or after your round and browse through name brands. Chipping and putting areas are available to help you improve your short game. 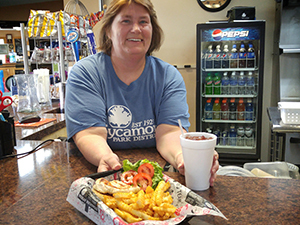 The Caddyshack Grill, located inside the clubhouse, offers a variety of menu options for your individual taste. Open to the public. Due to seasonal changes please call for current hours 815-895-3365. 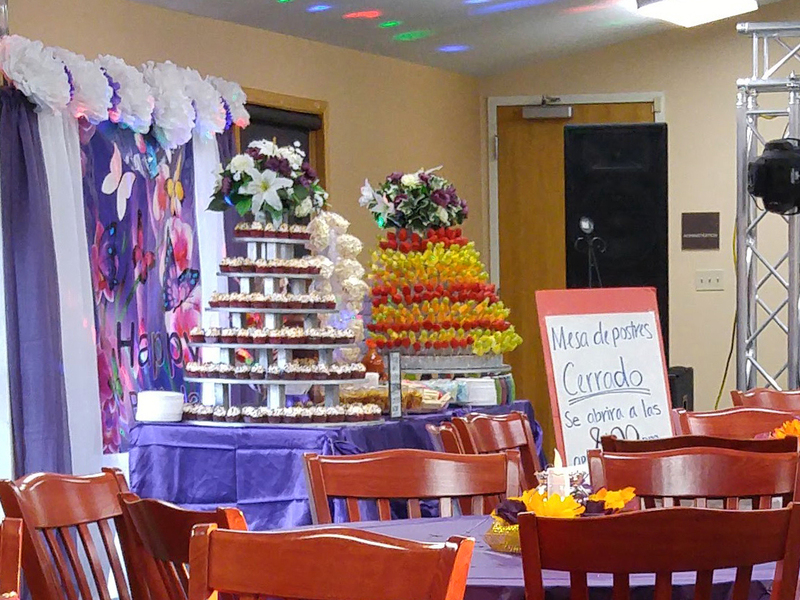 For catering informaiton, contact Melissa at melissad@sycamoreparkdistrict.com. The Sycamore Golf Club is a full-service Sycamore golf facility. From the standard outing packages which include green fees, cart fees, and range balls to the great snacks at our snack bar, we will address all your needs. When it comes to golf, our professionals know just what it takes to conduct a smooth event. Their years of experience will be evident from the moment you begin planning your event. The rolling terrain of Sycamore Golf Club are the only "bumps" you are likely to experience with your golf event at our facility. For information or to start planning your outing, call 815-895-3384 or email Kirk at krikl@sycamoreparkdistrict.com. This event to benefit the Shriners Children’s Hospital of Chicago. The annual scramble sponsored by Ski’s All American Pub. This event is open to all junior golfers from the ages of 7 to 18. Flights are based upon age. 7 – 9 year olds play 9 holes each day for a 18 hole total. 10 – 12 year olds, 13 – 15 year olds and 16 – 18 year olds play 18 holes each day for a 36 hole total. The top three finishers in each flight receive trophies. Entry fee is $25.00 per player for the 7 – 9 year olds and $35.00 for all other age brackets.Each participant will receive a complimentary gift, a sleeve of balls and lunch each day. Entries Open: Monday, June 17th. Annual fundraising event to benefit the FOP Scholarship Fund. This event is the first of many as a fundraiser for the Opportunity House. For more information call (815) 895-5380 or (815) 754-7772. The annual scramble sponsored by PJ’s Courthouse. This event is a 72-hole stroke play.  Any season Pass Holder with a handicap of 10 or less can enter. Senior Championship Flight available for 55 and over. After the first 36 holes a cut will be made based upon the scores posted and the number of entries. Players missing the cut will be placed into their respective flights for the final two rounds. In order to play in the Annual Club Championship all players must have at least ten 18-hole scores posted in the CDGA Handicap System from Sycamore Golf Club. There is a $25.00 entry fee for this event. Three places are awarded. Winners receive a trophy as well as a percentage off the 2018 Season Pass. Men’s Flights A, B, C, D, Senior and Ladies Net. In order to play in the Annual Club Championship all players must have at least ten 18 hole scores posted in the CDGA Handicap System from Sycamore Golf Club. The final two rounds of the Championship Flight plus a 36 hole event for all other flights. The top Three scores in each flight receive a trophy as well as a percentage off their 2018 Season Pass.1st place – 100% off, 2nd place – 50% off and 3rd place – 25% off. Open to Season Pass Holders only. There is a $25.00 entry fee for this event. This event is in conjunction with Sycamore’s Pumpkin Festival. Field is limited to 30 teams of 4 players. Entry Fee: $100.00 per team. This fee does not include green fees or cart fees. Entries Open Saturday, September 28th and Close Friday, October 26th at 5:00pm or when the field fills. Whether you have been golfing your entire life, or have just begun to appreciate the game, the Sycamore Park District Golf Club offers a membership option that suits you. Our challenging course and friendly staff ensures our members will enjoy bringing guests out for a drink, as well as perfecting their game. We encourage you to request a tour of our facility, and welcome any questions you may have. For additional information about pricing and our application process, please fill out this form or call us at 815-895-3884. We look forward to hearing from you. Take advantage of our convenient and secure online booking. Search available tee times by clicking the button below.